High-end central London multi-zone development chooses Tyco Security Products’ C•CURE 9000 Security and Event Management system to unite its building management, access control and video surveillance systems for comprehensive management of the site’s physical security. Land Securities is the UK’s largest listed commercial real estate company. Its £14.5 billion portfolio totals 23.6 million square feet and includes some of London’s most desirable office buildings and the UK’s most successful shopping and leisure destinations. Land Securities appointed Skanska to start work on the £260 million development in Central London comprising of two distinct buildings united by a new public piazza named New Ludgate. Together, the buildings include more than 355 000 square feet of office accommodation and 26 800 square feet of restaurant and retail facilities. After an extensive competitive tender process, Universal Security Systems was chosen to design and build a fully integrated security system to protect the site, people and assets at its prestigious new development. 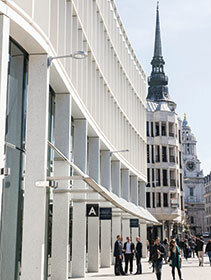 The New Ludgate site was built as two separate buildings with video surveillance, access control and video door intercoms, which were installed during the building construction phase of the project. It was vitally important to Land Securities that the development’s new security system could integrate the various systems together and synthesise their data to provide a clear and total security picture, preferably through a single user interface. Land Securities also sought a security solution for New Ludgate that could provide the scalability and flexibility to accommodate additional tenants in the future and to adapt as the use of the buildings evolved. The security team at Universal Security Systems worked closely with engineers to design an integrated system that could provide an intuitive GUI for video management, IP video surveillance, lift integration, access control and video intercoms. Since several disparate systems needed to be integrated together, integrator Universal Security Systems wanted to be able to test the unified system before installing it at New Ludgate, opting to build the entire security system for a full FAT (Factory Acceptance Test) prior to the final installation. Together, Universal Security Systems and Land Securities chose Tyco Security Products’ C•CURE 9000 Enterprise to unite the New Ludgate buildings’ disparate systems together. The C•CURE 9000 user interface provides the single, comprehensive security view that Land Securities desired from its new security system. Using C•CURE 9000, security operators can monitor events in real time, manage personnel, create reports, display dynamic views, and monitor system activity using a desktop computer, web client or the C•CURE Go mobile app. The choice of C•CURE 9000 Enterprise provides New Ludgate with an advanced distributed architecture that can be scaled according to needs and growth. C•CURE 9000 also gives New Ludgate the option of implementing visitor management with a visitor management web portal, and offers conditional access and dynamic area management for areas requiring supervised entry and occupancy. Using C•CURE 9000 to manage and access data from all of the different systems provides the option for advanced reporting, which can be used to understand events and patterns, and overall business intelligence as well. The completed project at New Ludgate delivered a fully scaleable, integrated security system including video, access control, intercom and lift services. The C•CURE 9000 solution enables Land Securities to manage and let out the site to many different tenants, whilst simultaneously ensuring the overall safety and security for the site. Because the security system was built on a virtual local area network, it is a scalable solution that enables future expansion.